Of all matters that draw people to the Ancient-Future path, worship is at the top of the list. As N.T. Wright explains in the following video clip, people all around the world are starving to meet with God in worship. Wright draws from his own experiences of spiritual formation, his experience as a minister in cathedrals that practice daily, and even hourly worship, and his observation that life in a secularized world has created a deep hunger for worship. And once a week is not enough. He encourages us to be imaginative and to recognize the value of liturgy as well as spontaneity in our personal, family, and corporate worship. I feel the desire to “return” more often than once a week. And his last comment on liturgy is spot on–the pressure to be spontaneous can be overwhelming! I find it so much more freeing to have a throughful, deliberate liturgy to turn to and focus on the act of worship rather than the act of trying to be novel or clever or whatever…. Regarding what Bp Wright said about family prayer: I do most of my formal devotional prayer out of the 1979 Book of Common Prayer, though I occasionally use the 1928 BCP and an Easter Orthodox “Western Rite” BCP. Something that was recommended to me when I began to develop the discipline of formal prayer throughout the day was to use the shorter forms initially so it is not overwhelming. In the BCP tradition there are short (just a page or two) abbreviated versions of the daily services that are typically titled something to the effect of “Devotions for Individuals and Families.” They are structured similar to the Daily Office but are more bite-sized. Sometimes I still use those when I’m really, really pressed for time or just can’t focus well enough for a full service. I can’t speak for other traditions’ prayer traditions, but that was very helpful in mine. Wright uses the word “jolly difficult” in that video, which, in and of itself, is a good reason for watching it. Thanks for posting this, Chaplain Mike. I really like Wright’s general attitude that worship, regardless of the form or setting, is a good thing — and his emphasis on facilitating worship, through both creative and more traditional means, rather than (as is the habit of many) promoting worship as either an exact formula handed down to us through a particular church tradition or a purely individualistic, make-it-up-as-you-go kind of thing. There’s plenty of evidence in scripture of both well-ordered worship designed to focus the heart and mind on Him and spontaneous, highly emotional outbursts of love and enthusiasm toward God. I think it’s odd that churches and their worship services tend to gravitate almost exclusively toward one or the other — and only very, very rarely embrace and express both. However, from the perspective of worship leaders, I can realistically see how difficult it would be to plan out a detailed worship service and then be flexible enough to modify or even scrap that plan if the Spirit happens to inspire something unexpected. Still, I don’t see why churches couldn’t make space for both scripted and unscripted worship — maybe strict traditional liturgy on Sunday morning and then dancing like David in the evening. I know it sounds strange, but why not? It would probably be a spiritually healthy thing. Honestly, sometimes we indeed need to be quiet and contemplative before our God — and sometimes we need to break out of these Stoic Greco-Roman shackles and allow ourselves to be children frolicking around the feet of our Father. I know that Tom Wright (or N.T. Wright) has left or is leaving off being a bishop and instead will be a professor at a university where he will have more time to write. Do you know if he can continue to be addressed as “Bishop?” If not, I guess we will get used to calling him Prof. Wright or maybe Dr. Wright if he has his doctorate which I assume he has. I love him. I have three of his books and watched several of his videos online including one long one. He’ll still be a bishop, just not a diocesan one. That’s my understanding, anyway. Oh, OK, Isaac. I didn’t realize that. Thanks! I don’t have sound on my computer. Anyone know of any place online where this is in written form? N.T. Wright hit on a topic my husband and I were discussing just a couple weeks ago. My husband admitted that he dreads Bible study and devotions because of having to pray spontaneously out loud. I can kind of see what he means, since spontaneous prayer can be bit pressuring: there’s always this little element of ‘oh no. Everyone’s watching to see how sponteously spiritual and heartfelt I can be! 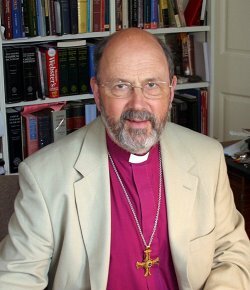 I couldn’t agree more with what N. T. Wright says. You’re not just joining in with what the others in your assembly (whether just 1 or 2 others in the home, or the whole congregation at church) are saying, but are joining in with what Chrisians all over the world and through the centuries have said and are saying. It’s like wading into the ocean and letting the waves and current carry you into worship, instead of having to bring and paddle your own boat to get where you want to go. And the same thing is true when you’re praying solo. This is a good, short article by Bishop Wright about what the apostle Paul meant in describing the return of Jesus to earth. He doesn’t agree with the “rapture” theory. It’s Sunday, I just spent the morning listening to a sermon about sovereignty and determinism disguised as the call to be humble, it was delivered with a giant sledgehammer. They even had the gall to change the Apostles Creed to emphasize their view of sovereignty (it wasn’t even really a translation but a selection of parts, reworded. What Rubbish!!). My heart is broken and I’m tired of this damned Evangelical Wilderness, it’s lonely out here and I long for the ability to actually worship with reverence. To commune with other believers to sit and learn about the scriptures, about faith and about the Christian life. What N.T. Wright is saying here hits home, and just this morning my wife and I talked about just worshiping at home and getting away from all the evangelical nonsense. This whole Ancient-Future thing is so painful, because we are trapped in a society that doesn’t give a rip about the past. Even when they honor the past, they screw it up by bringing along all the modern nonsense. I was thinking of looking at the RCC, but I’m afraid of what I might find and I’m not sure I can take much more before I trade my tent in this wilderness for a more permanent place to stay, because I’m not sure there is any way out anymore.